Count nouns are objects, persons or abstract conceptions that can be counted by integers, e.g. dat ’stone, rock’, θwe ’tool’, ki ’shape’, tal ’label, name, word’, méda ’human being’, kwor ’plant’, ba ’leg, pillar’. A mass noun on the other hand is anything which is measured in size or volume, like pal ’water’, kas ’fire,’ ϕu ’air’, bjo ’area’. Since mass nouns are continuously measurable, they take the same endings as states (see below), but cannot have tense. States usually vary on a continuous scale (absolute or relative) where they can take small or large values. Examples are: prus ’vertical position’, tle ’temperature’, tra ’size, volume’, kin ’degree of hardness’, twi ’speed’, tat ’point in time’, pni ’degree of fullness’, hus ’degree of weight’. They function like abstract nouns, but can also be used attributively to describe other nouns (in this way they are like adjectives) and may be put into past and future tense (like stative verbs). There is a separate set of postpositions used with states (in this way they are like nouns). Languages without adjectives are of course well-known, for example Korean, which uses stative verbs instead, but Talmit’s states should be probably rather compared to participles, sharing traits with both nouns and verbs. However, they are not derived from verbs. Multiplets alternate between a fixed amount of states or discrete samples, usually two. These can be such states as hal ’alive/dead state’, with aχál ’alive state’ and iχál ’dead state’; or count nouns like the paired parts of the body, e.g. plézne ’hand’, palézne ’right hand’, pilézne ’left hand’ (left-right direction is the underlying doublet state here). I call this the signum of a state – aχál is the positive state of the root hal or has positive signum while iχál is the negative state with negative signum. A destative verb is used whenever an action is completely described by the change of one state alone – for example, sparússun ’to rise’, spirússun ’to descend’, salparússun ’to raise sth.’, salpirússun ’to lower sth.’ from parús/pirús ’position above/below’. 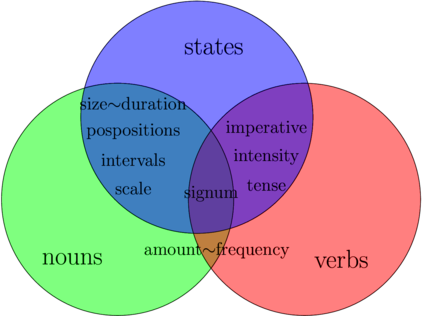 Associated verbs are derived from nouns/states, but they have a newly developed meaning, e.g. prúχsemun ’to lead’ from prúχus ’degree of importance’. Proper verbal roots usually express changes that involve complex processes which cannot be conveniently described by one state only, e.g. tébnun ’to think’, aχágun ’to eat, consume’, táplun ’to say’. They are always perfective in sense, the present tense describes a habitual action. Hence táplun ’to say’ is an action, but there is no verb ’to speak’, since this is a state and is expressed by the verbal state táplon or the compound taplendé ’process of saying, speaking state’.